Boyd Tonkin, Literary Editor of the Independent, attended the Mykonos conference and wrote down his impressions. A version of his article appeared in the August 15, 2005 edition of the Independent . The progress of mathematics abounds in tall tales and unlikely stories. And they don’t come much more improbable than this. Outside, the July sun of the Aegean is hammering down on the cobalt seas of Mykonos, on the island’s terracotta landscape, and on a discreet coastal hotel designed to mimic the clustered white cubes of a Cycladic village. Inside a conference hall, America’s most charismatic statistician addresses a gathering that can boast several of the world’s top mathematicians as well as a motley, if not quite random, assortment of science writers, novelists, historians and theatre people. And what exactly is he doing? He’s performing a card trick. Persi Diaconis, now of Stanford and Harvard universities, once made his living out of card tricks, and all the other secrets of his youthful trade. As a teenage prodigy, he toured the US as junior sidekick to one of the most famous magicians of the age. Then, via gamblers’ after-hours talk of odds and probability, the sorcerer’s apprentice caught the maths bug and took the first steps towards a career in another sort of spotlight. Diaconis was the expert who unmasked the delusions behind the so-called “Bible Code,” but today in the Aegean he’s merely baffling an audience of his peers. He chucks a deck of cards towards this crowd of highly-qualified punters. It’s caught by the tall, angular figure of Timothy Gowers, professor at Cambridge and recipient of a Fields Medal, the maths equivalent of a Nobel Prize. Gowers cuts the pack, takes the top card, then passes it to a neighbouring mathematical titan, and so on. After five cuts, Diaconis asks holders of red-suited cards to stand up. Two do. After a spot of stage banter, he proceeds to tell all five exactly which card they hold. Cue a burst of awestruck applause. But that’s another story: one of scores, about mathematicians, what they do and how they think, that surfaced in the first Mykonos conference on “Mathematics and Narrative.” Arranged by a group known as “Thales and Friends” after the ancient Greek geometer and philosopher who reputedly measured the pyramids, this unprecedented project to bring scientists and storytellers together was the brainchild of the writer, director and polymath Apostolos Doxiadis, who lives on the nearby island of Paros. Worried that the maths he loves has drifted too far out of the cultural mainstream, Doxiadis has already done more than his share of bridge-building. His novel Uncle Petros and Goldbach’s Conjecture (Faber) helps to convey the life-enhancing, and sometimes life-consuming, attraction of pure mathematical research. It prompted his UK publisher to offer a million-dollar reward for a proof of the titular problem, why every even number can be expressed as the sum of two prime numbers, and to take out pricey insurance against the slim chance of a successful claim. Hot-blooded, argumentative, quick to quarrel and quicker to laugh, the mathematicians of Mykonos behaved pretty much like their counterparts from the other shore of the two-cultures divide. They felt, and sounded, far more like a volatile mixture of creative artists than some sedate moot of joyless number-crunchers. Aptly enough, the celebrated French mathematician Pierre Cartier turned out, in his blue conference T-shirt, to be a dead ringer for Pablo Picasso. Rebecca Goldstein, a philosopher and novelist who writes in her fiction about the “essentially tragic” lives of mathematicians, called her pet subjects “as bad as novelists in terms of ego.” Or as good, you might equally say. In any case, this sharp-witted and often silver-tongued bunch comprehensively disproved the joke told by John Allen Paulos, who writes funny and instructive books, such as Innumeracy, about the use and misuse of statistics in the media and politics. “How do you define an extravert mathematician? Someone who looks at your shoes when he’s talking to you.” Not on Mykonos, where dudes and not nerds set the tone. If you want evidence of the problem that they gathered to confront, look no further than today’s newspapers. Millions of people now enjoy Sudoku puzzles. Forget the pseudo-Japanese baloney: “sudoku” grids are a version of the “Latin Square” created by the great Swiss mathematician Euler in the late 18th century. Yet these legions of keen amateur problem-solvers tackle puzzles accompanied by the absurd assertion that “no maths is involved” in them. Robin Wilson, prolific populariser and Oxford mathematician, admitted that even his new book, How to Solve Sudoku (written in a mere 11 days), carries that disclaimer. In parts of popular culture, mathematics has become not so much the love that dare not speak its name but the love that doesn’t even know its name. So, as the sun blazed and the sea sparkled offstage, we heard stories about the extraordinary rhythms of breakthrough and breakdown that punctuate the history of modern maths, and stories about the thinking and imagining that mathematicians do on the cutting edge of creation. John Barrow, another Cambridge professor, showed how his images of infinity reached the stage to become a sell-out sensation at the Piccolo Teatro in Milan, under the visionary direction of Luca Ronconi. Harvard mathematician Barry Mazur showed at the chalk-face (or rather, on the overhead projector) how one specific stumbling-block in research can open the way to a suspenseful story about that classic, and recurrent, conflict between a fixed principle and wayward data. Marcus du Sautoy, Oxford mathematician and Channel 4 pundit, delivered his multi-media gig about the mysteries of prime numbers and the long quest to prove Riemann’s Hypothesis: a show that takes in David Beckham’s Real Madrid shirt (a prime 23), some raucous audience participation and Professor du Sautoy himself on a surprisingly sweet trumpet. Less noisily, Tim Gowers ended his plea for concreteness and compression in mathematical explanations with some favourite passages from Alan Hollinghurst, Don DeLillo and Jonathan Franzen, to highlight the skills that good novelists have, and that most mathematicians lack. To hear this homage to the art of fiction from one of the mathematical giants of his time was a humbling moment for any arts-trained observer. It seems highly improbable that any congregation of top-flight writers would ever know or care enough to repay the compliment. 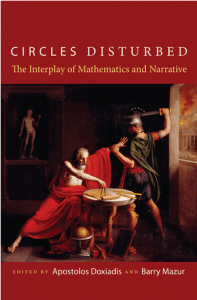 Of course, some writers and producers have turned to the lives and the works of mathematicians as a rich quarry of dramas and crises, both personal and intellectual. A gifted populariser such as Simon Singh can now sell in the hundreds of thousands, as he did with Fermat’s Last Theorem, a textbook example of how to portray mathematical research as a quest story of exploration, discovery and Everest-style conquest. Sylvia Nasar’s bestselling biography of game-theory pioneer John Nash, and his decades-long thralldom to mental illness, led to Russell Crowe stumbling goofily over the screen in A Beautiful Mind. This familiar, Rain Man model of the pattern-seeking maths prodigy as a recluse, an idiot savant, or downright barking mad, has form and it has legs. It recurs in the print, stage and screen versions of the computer prophet and Bletchley Park cryptographer Alan Turing (such as Enigma). And it underlies even such a delightful fiction as Mark Haddon’s super-seller, The Curious Incident of the Dog in the Night-time, with its Asperger’s-afflicted teenage narrator always ready to reel off a catalogue of prime numbers. Not surprisingly, real mathematicians have decidedly mixed feelings about mass-market yarns that present their domain as the exclusive stamping-ground of eccentrics or even lunatics. But, for the most part, they applaud the endeavour and enjoy the result of attempts to bring the human struggle of mathematical reasoning to a wider public. Only one (absent) literary figure really fell foul of the Mykonos mob: the hip, and maths-fixated, American writer David Foster Wallace, who in Everything and More wrote not a novel but a purported history of the mathematics of infinity. Computer-science guru Martin Davis counted “86 really egregious errors” in Wallace’s book when he received it for review. “Are we so hard up for approval from the humanities that we have to accept this?” he thundered about a work “so dreadful as to be almost beyond belief.” The moral for artists with a mathematical tale to tell would seem to be: stick to fictions, and leave the facts to the pros. And yet… the history of modern maths features such a wealth of near-incredible narratives that certain kinds of faction or docu-drama will exert a huge appeal. After all, this is a field that, early in the last century, plunged into a “foundational crisis” that left its finest minds believing that they stood not on solid rock but on shifting sand. Out of that collective breakdown grew ideas about general computing machines that began as the purest, most abstract theory but, indirectly, ended up as the intellectual inspiration of almost everything we now do with technology. If mathematics counts as the art of reality, then you might argue that its artistic crisis gave birth to the modern world.